Shakespeare’s dark and tragic play retold in a heart-pounding New York Times bestselling thriller from the author of The Snowman and The Thirst. 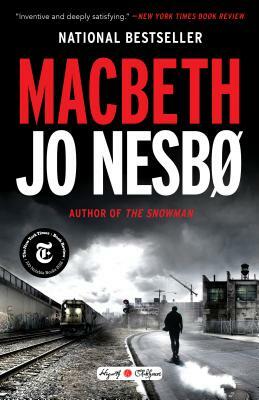 Set in the 1970s in a run-down, rainy industrial town, Jo Nesbo's Macbeth centers around a police force struggling to shed an incessant drug problem. Duncan, chief of police, is idealistic and visionary, a dream to the townspeople but a nightmare for criminals. The drug trade is ruled by two drug lords, one of whom—a master of manipulation named Hecate—has connections with the highest in power, and plans to use them to get his way. JO NESBO is a musician, songwriter, and economist, as well as a writer. His Harry Hole novels include The Snowman, The Leopard, and Phantom and he is the author of several stand-alone novels, including The Son, as well as the Doctor Proctor series of children's books. He is the recipient of numerous awards, including the Glass Key for best Nordic crime novel. "Nesbø has adhered to his contract, delivering a book that plays off of Shakespeare's work but succeeds as his own." "Jo Nesbø is my new favorite thriller writer." "Nesbø's much-heralded gifts are on display--using his talent for conjuring the chilly Munch-like atmospherics of Oslo in the winter and his eye for grisly, alarming details that slam home the horror of the evil that men do." "The world is dark and frozen, according to Nordic noir, and so is the human heart. But it's the magic Nesbø works with the genre's tropes that matters. . . . [He] might be my favorite of the lot."